Continuing my seasonal trend of all things Concord Grapes, I had the sudden idea to make these awesome jammy rolls with some leftover jam. Which, of course, means I’ll have to make more jam. They’re basically made the same way as cinnamon rolls, but are filled with concord grape jam instead of cinnamon sugar. Topped with a little drizzle of lemon icing, and they’re pretty much amazeballs. Soft, dense dough holds in the gooey grape filling. The lemon icing, which couldn’t be easier to make, perfectly accentuates the flavors of the Concord Grapes, adding a little zing! to their sweetness. Granted, they could be made with any jam you happen to have on hand, but I think the flavor of the grape is robust enough to hold its own against that amount of dough. So go get yourselves some of the last grapes of the season, and make this recipe for a wonderful weekend breakfast treat! In a medium bowl, mix the warm milk, melted butter, sugar, yeast, and 1 cup of the flour. Mix thoroughly. Continue to add flour until the dough comes together into a cohesive mass. Turn out onto a floured surface, and knead until it is smooth and elastic. Place in a clean, greased bowl, cover with a dishcloth, and allow to rise until doubled in size, about 2 hours. Tip the risen dough out onto a floured surface again, and roll out into a long rectangle, about 22″x11″. Spread the softened butter over the top of the dough, followed by the jam. Make sure that the jam is spread evenly all the way to one long edge. Starting with that edge, roll the dough into a long, jammy log. Grease an 8″x8″ baking pan. Using a sharp knife, slice the log into rolls about 3/4″ wide, and arrange in the pan. Cover again, and allow to rise for another 45 minutes. Bake in a preheated oven at 350F until the tops are lightly golden, about 20 minutes. Remove from oven, and allow to cool. In a small bowl, combine the confectioners sugar with enough lemon juice to make it a smooth, drizzleable consistency. 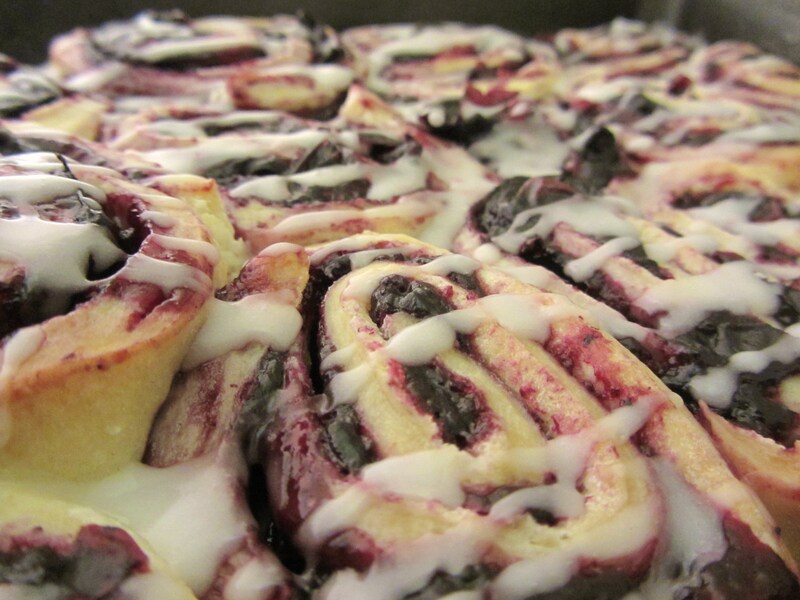 Drizzle over the cooled rolls, and eat ALL of them. Oh my gosh! They look like they would be amazeballs! Totally going to have to put these on my must-make list. Delicious! I am not the biggest fan of cinnamon rolls, so these are PERFECT for me!